There are kettles. There are teapots. And there are kettle teapots. Yep, I said “kettle teapots” … or even “teapot kettles” as some call them. They have been around about as long as humans have been drinking tea, but they tend not to be as in the public eye. Time to give them some exposure, starting with pointing out which is which. Generally (I have to qualify things here since you creative designers out there keep coming up with all kinds of new designs that blur the lines of distinction), kettles are have a handle that arcs across the top of the kettle’s body. Teapots, for the most part, have handles on the side. Some are directly opposite the spout and others are at a 90° angle. A side handle tends to be more graceful for pouring at table. Generally (once again qualifying), kettles are used to heat water while teapots are used to infuse the tea leaves in the water that the kettles heat. As such, kettles tend to be made of heat-conducting materials that won’t be damaged by an open flame, the heating element of a stove or hot plate, or the heat generated by the plug in the wall. 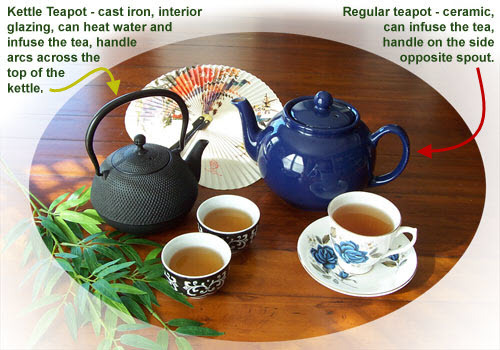 Teapots, as the vessels of infusion, need to be made of less heat-conducting material so the tea doesn’t cool before the leaves have a chance to steep. Some do this better than others. Silver teapots are recommended for black teas but tend to conduct heat so well that many have wooden handles so you don’t scorch your fingers. Special clay teapots from China called “Yixing” are much better at holding in that heat. Glass teapots are visually fascinating but again let the tea cool fast. But then I guess that’s why teapot cozies are so plentiful. Kettle teapots (or teapot kettles) meld together the two designs but not necessarily the two uses. Their handles are arced across the top but they are made of ceramic, porcelain, silver, and even glass. They are mainly about style, it seems, and not about function. They infuse the tea leaves but are a bit awkward to pour from in my estimation and certainly are not fit for sitting on an open flame – the exception is some cast iron teapots that are glazed inside so that they can be used to heat water and infuse the tea leaves. I have such a cast iron kettle teapot in my personal collection, and there are plenty of other examples out there. Whatever style you go with, the kettle teapot will be a great addition to your bevy of teawares! I like these style! It’s suitable with my living room!